It’s widely accepted that Resident Evil has fallen out of favor with fans, with more recent games moving away from survival horror and taking a far more action oriented approach, and even failing to succeed within that genre. When Resident Evil 7 biohazard was announced to once again be changing the formula of the series, there was a certain skepticism. Could Capcom get it right this time? Would a first-person approach bring the series back to its roots, or shovel it into the pile of other first-person horror games that have become so common? 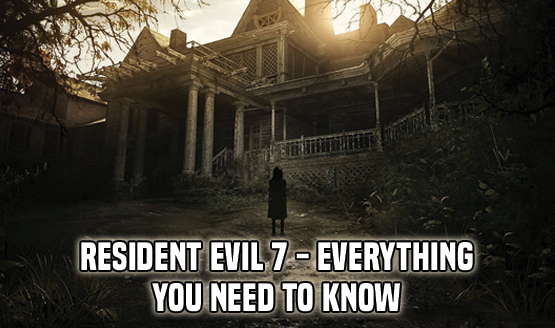 Is Resident Evil 7 even Resident Evil anymore? At first glance it may not seem so, but closer inspection reveals those telltale mutations that make Resident Evil stand apart from games like Outlast and Amnesia. Remember that the original Resident Evil didn’t begin with knowledge of the T-virus. It began with entering a derelict mansion haunted by the moans of the undead. Resident Evil 7 biohazard begins in much the same way. Ethan is looking for clues about his missing wife who was presumed dead three years earlier. His search leads him to the decrepit Baker house in the swamps of Dulvey, Lousiana. The setting sun provides a last bit of daylight and hope before the door shuts behind Ethan and the nightmare begins. The stage is set for Resident Evil 7 to be much like other first-person survival horror games, but there’s a key difference that maintains its faithfulness to the Resident Evil franchise. Games like Outlast remove your ability to fight back, relying on the flight instinct to relay fear. 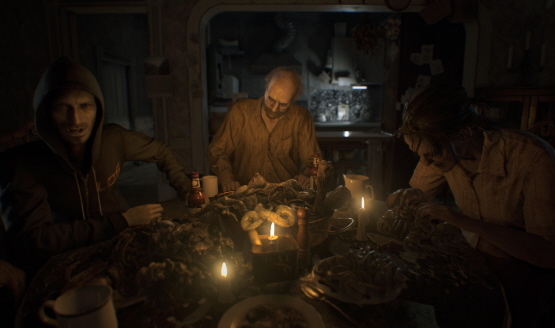 Resident Evil 7 retains real-time limited inventory management, including weapons used to fend off the ever present threat of the cannibalistic Baker family. The first-person perspective actualizes the horror and connects the player to it in ways that third-person perspectives cannot. This is amplified tenfold in virtual reality, but we’ll get to that aspect later. Even on a standard screen, Resident Evil 7’s best moments get the heart racing and turn the local vocabulary into a slew of four letter curse words. Committing to atmosphere more than jump scares, the Baker house never feels safe. You’re in their territory and it feels like any one of them could be right around the corner or just behind you at any given moment. Part of that atmosphere is created by an expertly crafted soundscape that makes the environment palpable. Creaks, footsteps, distant voices. Water dripping and squishing. The sound of your own footsteps. The sounds encompass you and bring the dilapidated property to life, something that helps some of the backtracking not feel so repetitive. A lot of games utilize backtracking through old environments, but as I retread pathways on the Baker property, opening up secret passageways and revisiting the same rooms multiple times, I found a sense of completeness. Instead of groaning at having to go back upstairs to unlock a previously barred door, I crept up again slowly, remembering previous events in these upper rooms, and not knowing what to expect as I headed back. For a horror game not to lull me into a sense of ease and complacency during backtracking is a true feat, as most survival horror games tend to become less and less scary the longer I play, instead of doubling down and becoming increasingly unpredictable. Resident Evil is known for its environmental puzzles, and this one doesn’t disappoint. It’s amazing how intense a simple puzzle can be when you’re being stalked by Marguerite Baker, or when trying to hide from whatever the hell lingers in the basement. The first-person view once again comes into play, as attempting to solve a puzzle when you can’t see what’s around you is nerve wracking. Resource management becomes a crucial part of working through each area, and deciding what to store and what to bring with you creates dilemmas that add to the tension. Should you use two inventory slots for the shotgun, or will the single slot handgun suffice? Will you need the burner? What do you leave behind in order to bring items you need to solve a puzzle? 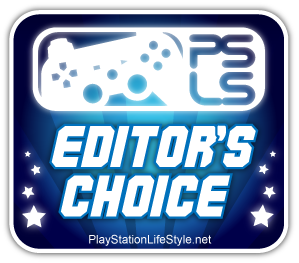 One of the trophies even offers an additional challenge by only allowing you to open the item storage chest three times, and at least one time is necessitated by the story. These kinds of elements are classic callbacks to the feeling of how Resident Evil played, and the first six or so hours of the game feel like a re-imagined version of the original, all with its own unique vibe. With as many endowments as Resident Evil 7 pulls, newcomers can feel secure that it stands alone as its own title. While it does eventually tie in with the overall Resident Evil mythology and there are plenty of Easter eggs for longtime fans, there’s nothing here that will leave new players stranded. The latter third of the game takes a distinct turn from steady horror in exchange for more rapid exposition, but it never feels too out of pace, instead naturally progressing along with Ethan’s journey. Hopefully it manages to set the stage for the continued success of this reemergence of Resident Evil. Since the inception of virtual reality, players have been calling out how perfect the platform is for horror games. Capcom have answered these calls by making the entire length of their AAA title compatible with PlayStation VR, something I took advantage of for the duration of my initial 10-hour playthrough. Though I was nervous about the possibility of feeling nauseous in free motion VR (a problem I had with Robinson), my first chunk of playtime was eight hours without ever removing the headset, and even then it only ended because I needed to get enough sleep. Utilizing the default comfort settings, I never felt any kind of head or stomach sickness for the entirety of the campaign. Starting the game with VR offers a tutorial that gives a brief overview of the comfort options and what they do, something I’ve found sorely lacking in many other games (again, an issue with Robinson). There’s a high level of customization in these settings so you can make the game feel as immersive and comfortable as you want. As palpably terrifying as the game is outside of virtual reality, having that horror surround you is another level entirely. At first I was put off by the lower graphical fidelity, but my brain quickly overcame this small issue and I was fully immersed. While it’s a notable difference in side by side comparisons, it’s still one of the best looking PSVR games, and the absolute best way to experience the horror of the Baker mansion. An early death by chainsaw made me question if I really had the power tool ripping up my guts. Having my hand pinned to a wall with a screwdriver sent an odd feeling through my real palm. Every noise made me spin around like a madman, enough that I had to stop playing with headphones and just use my surround sound so that I could maintain some small connection with the real world. It’s that scary. VR works so well because the slow paced nature of Resident Evil 7 lends itself to that environmental dread, walking down a hall or through a doorway and expecting every possible scary thing on the other side. The immersive sense of presence makes each moment personal, from the intimate moments with Jack force feeding you human remains and shoving a knife in your mouth, to the huge and creative boss battles that make you feel like you are being crowded out of the small room by their fearsome presence. Even though the TV version looks demonstrably better, I really can’t see myself playing Resident Evil 7 in anything but VR going forward. Altogether it’s a sharp crossroads between horror films like Texas Chainsaw Massacre and The Hills Have Eyes, and the classic slow paced survival horror of Resident Evil. The grotesque cunning of the murderous backwoods family is decidedly scarier than mindless creatures, and there are many moments that reminded me of those in the Spencer mansion, like things crashing through windows and creative massive scale boss fights. By the end, Resident Evil 7’s place within the Resident Evil franchise is definitively confirmed, and it marks not just a clear uptick, but a new beginning for a flagging series that was in desperate need of a shot in the arm. Add in that it’s one of the best VR experiences to date, and the PS4 version of Resident Evil 7 biohazard is not just a great Resident Evil game, or a great horror game, it’s a great game in general. Resident Evil 7 biohazard review code provided by publisher. Reviewed both on PlayStation VR and TV display. For more information on scoring please see our Review Policy.